This trip purpose would be part of becoming “guide” for my sisters for the shopping place, cheap and good place to eat and good place for enjoying the nite life. Arrived Bali in the afternoon, got pick-up by hotel car which is complimentary from Bali Sorgawi Hotel for reservation min.2 nites. This hotel is nice, down the alley from Legian main street and about 15-20min walk to the beach. The room is too small for 3 person, hardly can move but they have nice pool which is very important for me. I like refreshing myself in that pool. We got it for Rp.295 include xtra bed, AC, TV, shower, bfast for 3 persons. 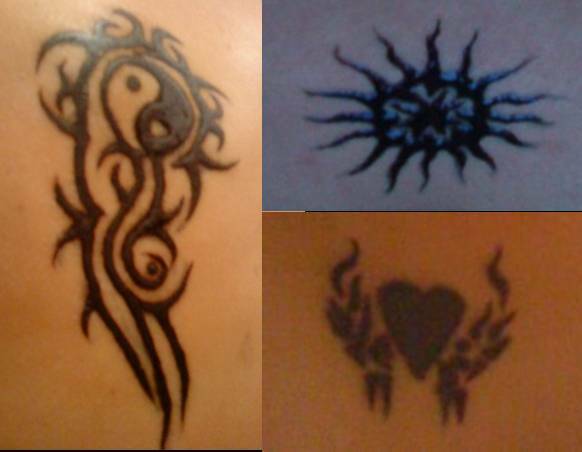 Well, first agenda of the day and always must be done when coming to Bali is to get Tattoo. So we got dressed, headed for the beach and looked for the tattoo guy. It usually costs about Rp. 20-25k for each. Then we went for dinner at my fave Warung Indonesia in Gang Ronta, Poppies Lane 2. It was crowded during lunch/dinner time but I like it here since it’s Indonesian Food and very cheap. I ordered rice + 2 kind of veggies + egg + sambal potato for Rp. 11k. At nite, hit the Bounty club in Legian til morning. Anyway, our plan is to go to Art Market in Kuta for shopping, we had lunch there. It was nice place, lunch in the beach under the trees. It’s in other side of Kuta beach but still called Kuta beach. The food is not bad also the coconut drink which we drink from that coconut directly. Then we had another crazy idea to go to Tanah Lot.. hahaha.. no license but we did it anyway and we made it to Tanah Lot. 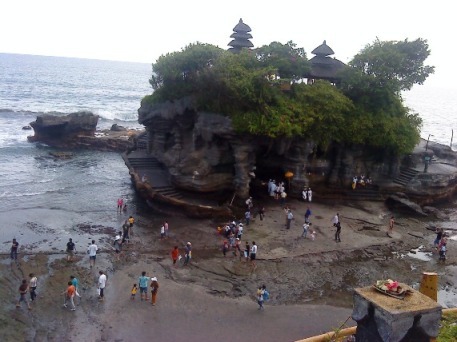 Why Tanah Lot?? Because there are many shops sell various “Kain Bali/Bali Clothes”. 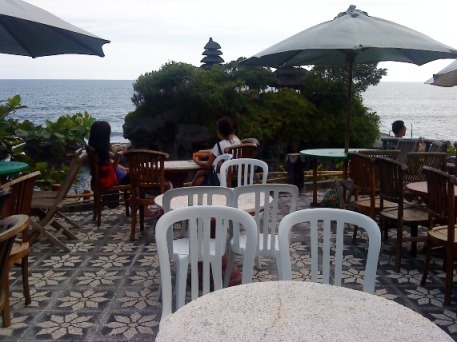 After shopping, we relax in Tanah Lot café which is above the hill. I had no idea there was café there. The drink is expensive but you can watch the beautiful sunset. Unfortunately, we had to skip the sunset since it is not good for first time driver, driving a motorbike at dark. So we went back to hotel in Legian, had dinner in hotel, the Nasi Goreng tastes good. Then dressed up and start exploring the nite life in Legian. We hit Paddy’s, the music there is good but not much guests so we got bored and went to Bounty for dance till morning J . This day our plan is to go for water sport in Tanjung Benoa. After having breakfast at hotel, I bought Nasi Jenggo in the Legian Street (only Rp.4k) for lunch at water sport spot. The watersport package from DrunkenBunny website offered us free transfer to/from hotel which is very value. 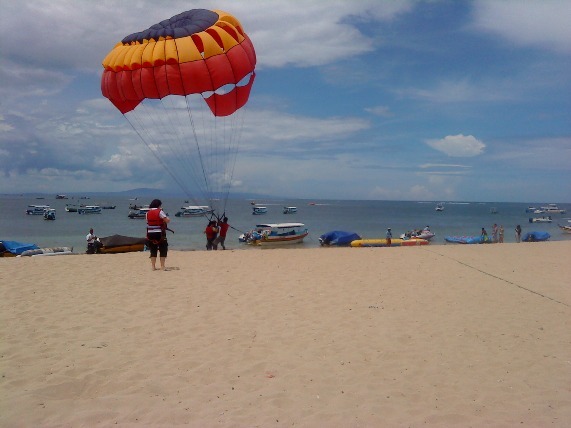 We took the package which include “Banana Boat + Parasailing + Snorkeling” for Rp. 225k/pax. Cheap!! The watersport went very well, I like the snorkeling but it has not much to see there, not much fish or coral. I want to explore the water further from the boat but I was afraid of many speedboats there. At least it is good experience for my sisters ^.^ The watersport took about 3-4 hours include lunch then we got back to hotel, got massage at spa just in front of the hotel alley and started shopping around Legian again. At nite, we had “big” dinner in Warung 96. 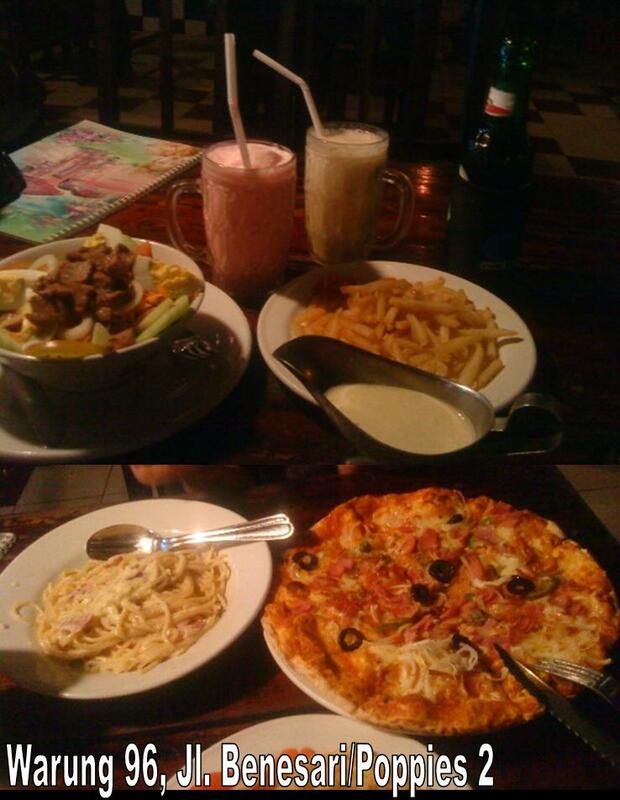 We ordered the House Pizza + spaghetti + beef salad + French fries + 2 milkshake + 1 banana juice + 1 beer + 1 mineral water for around 160k/3 persons. The taste is great, maybe because we hardly had a ‘regular taste’ food in Bali. Somehow the food in Bali has different taste than we usually have in Jakarta, the same meals, look same but maybe different ingredients. Anyway, that was one big meal during the trip. After full with these meals, we got back to hotel for swimming then dressed up and since it was our last nite in Bali, we went for clubbing til morning. We hit our fave place Bounty and went to Sky Garden til dawn. 2 hours rest then packing then bfast then we went to mini market in front of Kuta beach, relaxing while watching the people surfing. The weather was so good that day, cloudy and not hot so we sit in that mart bench till 11am. The went back to hotel for check-out, left some stuffs with the receptionist first till our departure time. 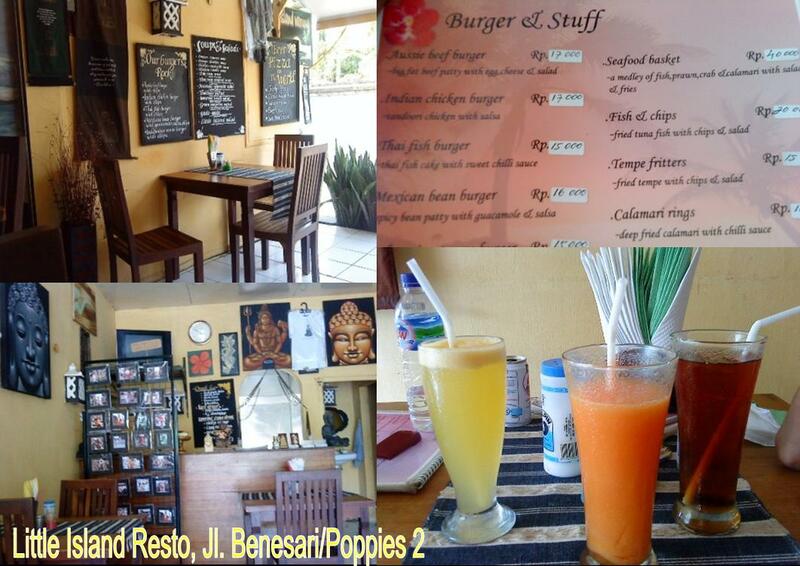 Had lunch at Little Island Resto in Jl Benesari, its burger tastes good. Then we spent the rest of time by searching at the hotel I plan to stay on my next trip. First we checked the Gemini Star Hotel located in Gang Ronta, Poppies Lane 2. It is a nice, clean hotel, the pool is small but somehow the hotel looks exclusive. It costs Rp. 134k/nite single, fan room NO bfast. Ups.. this hotel is too expensive for me, but maybe I try it later. Then next we checked on the Tunjung Bali Hotel in Poppies Lane 2. I saw the room downstair and it is clean with pink bathroom. The pool is great with trees around it, looks so great.. It costs Rp. 100k/nite single, fan room include bfast. I might choose this hotel later on..
Well, that’s all for this trip story. Next trip would be about diving in Tulamben or.. I dunno.. I am still wondering where I should go or what I should do on my next trip to Bali in the end this year..
I’m so excited when I read you’r stories. All the information you give. I can really move forward with it. May 27 I’m going to Bali. I was there last year but then I have not done so much it was more a family visit. But now that I read your blog I have much more meaning and you give me lots of good information. I wanted to thank you.